I have been working on a little script for a client of mine, that required product image magnification. The task was to create a script that will allow users to see large details of the product while moving cursor over medium sized image. During the process I decided to create a jQuery plugin and share it with you guys! Just as with all my script I try to keep things as lightweight as possible, and most important, as customizable as possible. I hope you’ll find this very easy to apply to your own websites. The script (and CSS) takes care fo the rest. You will notice the line-height property… I am using if for vertical alignment of the message text that is displayed while the detailed image is loading. Of course you can use your own positioning methods, your own text, insert extra markup if you want to and add your own CSS to style the preloader. Perhaps some preloader gif as a preloader image? I’ll leave that to you, what I am showing here is a bare-bone example that you can easily customize. The ID of the newly created image zoom element. Of course you can use your own, but make sure you update the CSS accordingly. 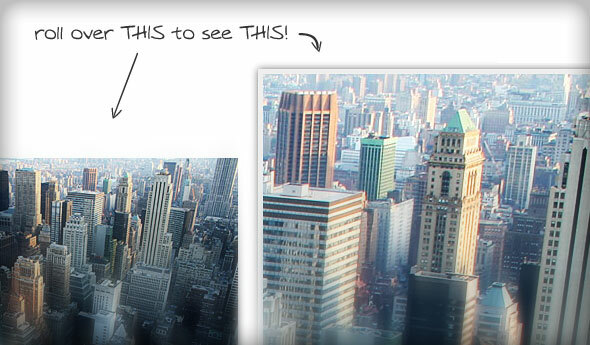 This defines the DOM element where newly created image zoom element will be inserted. You can insert it anywhere you like in the DOM by editing this option. If set to true (by default) the newly created element will be inserted as a last child of the parent element. If this option is set to false then the newly created element will be inserted as a first child of the parent element. A message that appears before the large image is loaded. You can use this option to write your own preload messages and insert any HTML you want. If you want to use the preloader gifs, I suggest you go with background images. In case the large image is not found or can’t be loaded, this error message will appear. You can use this option for custom error messages. In one of the next articles here on CSS Globe I will offer a one page portfolio template that uses this image preview, so stay tuned! In this article I am going to analyze what a perfect login page or login form should have. Also you are able to download the pure CSS3 login form for free. Login forms are very simple in terms of the required elements. When it comes to forms, it doesn’t get simpler than that. But some of the elements that could be valuable to your users (or potential members) are often neglected. Let’s take a look at what I think are necessary elements. I believe that each form should have a prominent title that briefly explains what the form is about. If you use login page, like in my example, it is important to mention the name of your website here, so the accidental visitors know where they are. Non-member visitors may stumble upon your login page one way or another. Why not think of them and offer them a direct link to the registration page. It will save them some time and you increase your chance of more new member signing up. Although login forms usually contain two input fields, it is important that they’re styled nicely so the labels are readable, and there is no. One thing that I often notice on the various websites is the lack of clickable labels. You should use FOR attribute on labels “connect” them with appropriate input field. It is such a small effort when coding and it can make a huge difference in terms if usability. This is also very important link. Many users have numerous accounts and passwords and they often can’t remember which one they used on your site. The best placement for this link is near the password field itself. This should, of course, be the most prominent thing in the form. For best results (by results I mean best user experience) it should always look like a button. Very useful feature that your returning users will appreciate. If your application supports it, include this option and your members will be thankful. One thing that I believe that is very important is wrapping the checkbox and the text inside the same label. Checkboxes are small and therefor hard to click on. If you wrap entire text inside the label, you enlarge the clickable area and that way making the life easier for your users. If you have full login pages, then you MUST allow users to change their mind about logging in and provide a link back to your home page. I have prepared a demo page for you to download (for free). 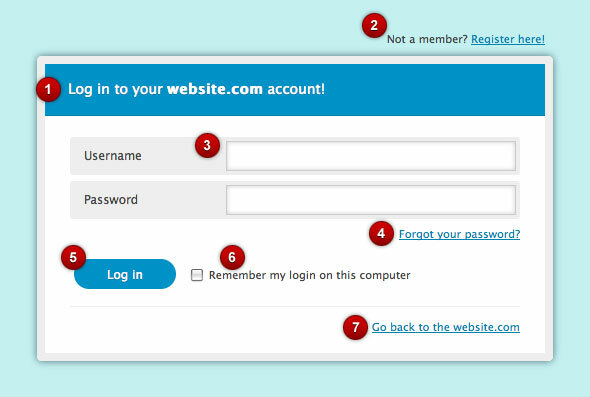 The login page is contains a pure CSS3 styled form and a simple validation script, ideal for learning purposes. Hope you’ll enjoy it! In this article I am going to use some of the CSS tricks to create a calendar icon you can use for your blog posts or something similar. It is important to notify that there are no images used here and the markup couldn’t be simpler than it is. The final result looks like the image below. We have a wrapping paragraph, although you may go with the DIV (or HTML5?s new element – TIME). Inside the wrapping element you need one extra element that contains a month’s name. Now, I have 2 elements to work with, plus I will create 2 pseudo element for each of the real elements which will give me total of 6 elements I can use to draw shapes and position them properly. Pseudo elements will be used for the calendar’s spiral (actually those are some kind of rings, not sure what is the correct English word for it… sorry about that). If you take a look at the image below the idea behind this will be more clear. First we style the container element. You will notice that I used box-shadow, border-radius and CSS gradients. Not all browsers will render all of these properties, but at least it will degrade nicely. Note that the fixed height is not defined, you control the overall height with line-height properties in both container and nested em element. Em element is also styled, it contains the month’s name. Now I am styling the pseudo elements. Container’s pseudo elements (:before and :after) are used to create thos circles, “holes in te paper”. It is important to say that if you’re going to customize the width there will be some tweaking needed, mainly for the placement of the pseudo elements.